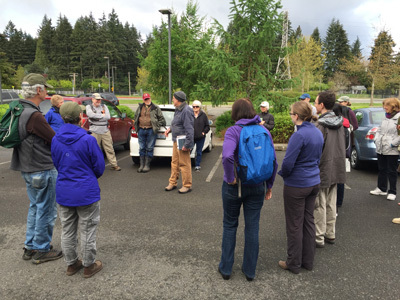 Twenty-five people came out to join Clay Antieau’s botany walk in the park May 6th. Clay is the president of the Washington Native Plant Society, and he enthralled the group with his vast knowledge of plants, both native and domestic. A park volunteer led us to the rare Vancouver ground cone, a “mycohetertroph” that we learned has no green leaves and gets is sustenance from an underground fungus or the native shrub salal. We discussed plants that live in mutualistic relationships with ants, either as pollinators or dispersers of seeds. We talked about how trees communicate with each other via underground fungal networks or through the air when attacked by insects, and we learned that those underground fungi can increase the effectiveness of a plant’s root system by up to 700%. We pondered why there is such a diversity of spring wildflower in east-coast forests compared to our Northwest conifer forests, and we left this question hanging for Clay’s scheduled walk August 12th: why do conifer forests dominate the landscape in western Washington?